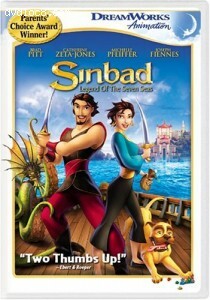 This page contains easter eggs for the disc Sinbad: Legend Of The Seven Seas (Widescreen) (DVD, Region 1). From the main menu, access the 'Kids Corner' option. Once there, press DOWN until a "golden bone" appears. It will be left of the list half way down the screen. Press your Enter button to select it and see a photo of 'Spike'. From the main menu, access the 'Audio' option then go back to the "Main Menu" . Now, press DOWN to reveal a "gold star" on the right side of the screen. Select it to reveal a brief "History Lesson Of The Edge Of The World". From the main menu access the 'Subtitles' option. Then go back to the "Main Menu" and press DOWN. This will reveal a "gold star" on the left side of the screen. Select it for a brief "History Lesson Of Tartarus".